It has been a long time since I have seen a thriller that actually thrilled me. Hollywood has been producing all of these cookie-cutter thrillers. The type of thriller where you know who lives or dies based on who is on the poster and who isn't. (Common knowledge dictates that if an actor has their name above the title yet does not appear on the poster or dvd artwork, then they are the killer.) With this in mind I went into Salt with pretty low expectations. Boy was I surprised when Salt turned out to be a great thrill ride. This is the type of movie that Hollywood used to make. You don't see the twists and turns coming so you are actually surprised when they happen. Sure the movie has plot holes that you can drive a truck through, but you aren't thinking of that when you are watching the movie. The story and action scenes take the place of logic as you watch the movie. However, when the movie is over, you begin to think and even debate with others the finer points of the movie. 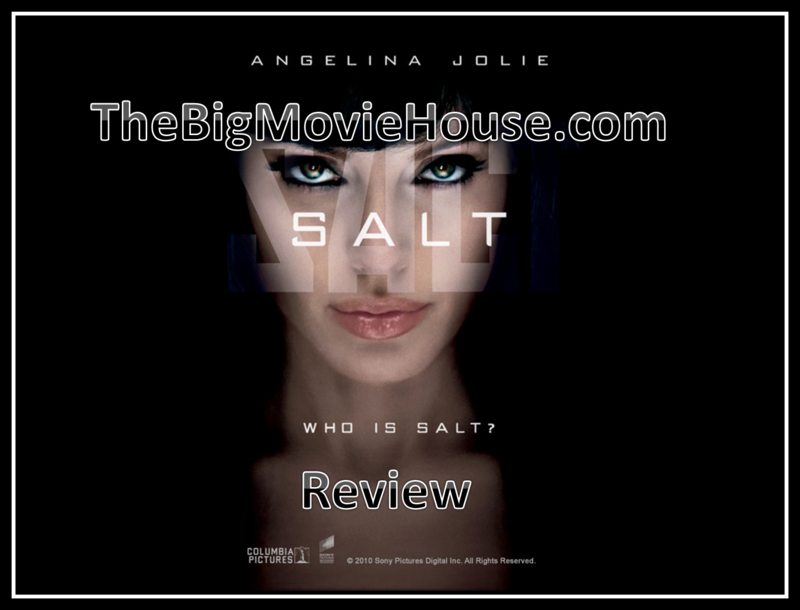 The movie stars Angelina Jolie as the title character. She works for the CIA and has a loving husband. As she is leaving work she is told that there is a russian defector who has some secrets to tell. She interviews the man and he tells her that the russian president is going to be assassinated. The man tells her that the name of the assassin is Evelyn Salt. Since that is her name she goes on the run to clear her name. The beauty of this movie is in the marketing. The trailers seem to give away every plot point in the movie, but the real kicker is: it doesn't. Everything in the trailers comes from the first thirty minutes of the movie. Everything after that isn't even alluded to in the trailers. This is key because there is a lot that happens in the last hour that we never see coming. I was pleasantly surprised by this as the people who make the trailers like to give everything away so there is no mystery. So what happens after that first thirty minutes? I am not going to tell you. I am not even going to hint at what happens so the mystery is up to you to find out. I will say that once movie is over and everything has been revealed, you will have a lot more questions than the movie has answers to. This really isn't a problem while watching the movie because this movie enthralls you from beginning to end. The movie was directed by Phillip Noyce, who has made his fair share of thrilling thrillers so you know that you are in good hands. Once Salt goes on the run, the movie doesn't let up for a minute. Noyce's direction is clear and precise. Every action scene in the movie makes sense and you can always tell what is going on. There is a scene that involves a lot of truck jumping and is one of the most tense action scenes I have seen all year. To say that Salt is one of the best movies of the year is an understatement. This is one of the best thrillers I have seen in years. For all the crap that Hollywood has been throwing at us all year, it is nice to see a movie that gets our adrenaline pumping. I had a great time watching Salt and I believe that you will too.